It’s 2053 — 20 years since you needed a computer, tablet or smartphone to go online. At least, that’s true in the developed world — you know, China, India, Brazil and even some parts of the United States. Cybernetic eye implants allow you to see everything with a digital overlay. And once facial recognition software was linked to high-speed records searches, you had the lowdown on every person standing around you. Of course, in polite society you still introduce yourself as if you don’t instantly know another person’s net worth, arrest record and Amazooglebook search history. (Yes, the fading old-tech firms Amazon, Google and Facebook merged in 2033.) You also get a tax break these days if you log into one of the government’s immersive propaganda portals. (Nope, “propaganda” doesn’t have negative connotations anymore.) So you choose the Iraq War 50th Anniversary Commemoration Experience and take a stroll through the virtual interactive timeline. Look to your right, and you see happy Iraqis pulling down Saddam’s statue and showering US Marines with flowers and candy. Was that exactly how it happened? Who really remembers? Now, you’re walking on the flight deck of what they used to call an aircraft carrier behind a flight-suit-clad President George W. Bush. He turns and shoots you a thumbs-up under a “mission accomplished” banner. A voice beamed into your head says that Bush proclaimed victory that day, but that for years afterward, valiant US troops would have to re-win the war again and again. Sounds a little strange, but okay. Admittedly, we humans are lousy at predicting the future, so don’t count on any of this coming to pass: no eye implants, no voices beamed into your head, no Amazooglebook. None of it. Except, maybe, that Iraq War timeline. If the present is any guide, government-sanctioned, counterfeit history is in your future. In 2012, the Pentagon kicked off a 13-year program to commemorate the 50th anniversary of the Vietnam War, complete with a sprawling website that includes a “history and education” component. Billed as a “public service” provided by the Department of Defense, the United States of America Vietnam War Commemoration site boasts of its “resources for teachers and students in the grades 7-12″ and includes a selection of official government documents, all of them produced from 1943-1954; that is, only during the earliest stages of modern US involvement in what was then called Indochina. The Vietnam War Commemoration’s educational aspirations, however, extend beyond students. “The goal of the History and Education effort,” according to the site, “is to provide the American public with historically accurate materials and interactive experiences that will help Americans better understand and appreciate the service of our Vietnam War veterans and the history of US involvement in the Vietnam War.” To that end, the United States of America Vietnam War Commemoration offers an interactive historical timeline. It’s an eclectic mix, but give credit where it’s due: the digital chronology does mention casualties from the oft-forgotten first US attack on Vietnam (an 1845 naval shelling of the city we now know as Danang). For the next 131 years, however, mention of Vietnamese dead and wounded is, to put the matter as politely as possible, in short supply. Flawed history, though, isn’t. Take the August 2, 1964, “Gulf of Tonkin Incident.” It was a key moment of American escalation and, by the looks of the Pentagon’s historical timeline, just what President Lyndon Johnson made it out to be when he went on television to inform the American people of “open aggression” on the part of North Vietnam. “The USS Maddox was attacked by North Vietnamese gunboats in the Gulf of Tonkin,” reads the entry. A later one mentions “US Naval Vessels being fired upon by North Vietnamese on two separate occassions [sic].” Case closed. Or is it? The official story, the one that kicked off a cycle of US military escalations that led to millions of casualties in Indochina, went like this: the USS Maddox, a destroyer, was innocently sailing through the Gulf of Tonkin when it was attacked by North Vietnamese torpedo boats on August 2, 1964. President Lyndon Johnson, showing great restraint, refused to respond militarily. Two nights later, the North Vietnamese attacked again, targeting the Maddox and the USS Turner Joy and prompting the president to take to the airways to announce that “renewed hostile actions against United States ships on the high seas in the Gulf of Tonkin have today required me to order the military forces of the United States to take action in reply.” Johnson sought and Congress quickly passed the Gulf of Tonkin Resolution — giving the president carte blanche to repeatedly intensify the war in the years to come. But as it turned out, there was nothing innocent about those US ships in the Gulf of Tonkin (as the President had implied). A claim of two separate attacks on US Navy ships turned out to be untrue and the congressional resolution had not been drafted in the wake of the supposed attacks, but had been written months before, in anticipation of an opportune incident. In addition, the single attack by those torpedo boats occurred in the wake of a maritime raid on the North Vietnamese coast — part of a covert program of attacks that Johnson had approved months earlier. None of this essential context can, of course, be found anywhere in the timeline. Still, everyone makes mistakes, so I meandered through the Pentagon’s chronology looking at other key entries. Soon, I found the one dealing with My Lai. The next morning, roughly 100 soldiers were flown by helicopter to the outskirts of a small Vietnamese hamlet called My Lai in South Vietnam’s Quang Ngai Province and followed Medina’s orders to a T. Over a period of four hours, the Americans methodically slaughtered more than 500 Vietnamese civilians. Along the way, they also raped women and young girls, mutilated the dead, systematically burned homes and fouled the area’s drinking water. It took a year and a half for a cover-up that extended from soldiers in the field to generals at the top of the division to unravel — thanks in large measure to veterans Ron Ridenhour and Ron Haberle and crack investigative reporter Seymour Hersh. What was first a ‘massacre’ quickly became a ‘tragedy’ and was then referred to as an ‘incident.’ General [William R.] Peers, whose exhaustive inquiry into the events at My Lai remains the best source for what really happened there, was warned by his superiors not to use the word ‘massacre’ at the press conference held on the publication of his report [in 1970]. More than 40 years later, the Department of Defense is still operating from the same playbook. The Vietnam War Commemoration’s interactive timeline refers to My Lai as an “incident” not a massacre, the death toll is listed at “more than 200″ instead of more than 500, and it singles out only Lieutenant Calley (who certainly had plenty of blood on his hands) as if the deaths of all those Vietnamese civilians, carried out by dozens of men at the behest of higher command, could be the fault of just one junior officer. Given the Pentagon’s take on the My Lai massacre, I was hardly surprised by the one-sentence timeline entry on Operation Speedy Express, which says little more than that the six-month operation in the Mekong Delta “yield[ed] an enemy body count of 11,000.” This has long been the military’s official position, but the Defense Department knows full well that it isn’t the whole story. In the early 1970s, a veteran who served in that operation sent a letter to the Pentagon (and then followed up with letters to other top Army generals) blowing the whistle on the systematic use of heavy firepower on populated areas which resulted in what he called a “My Lai each month.” His allegations were bolstered by those of US advisors and Vietnamese sources, as well as by an internal report commissioned by the Army’s acting general counsel, endorsing the whistleblower’s contention that an obsession with what was called “the body count” likely led to civilian deaths. The veteran’s shocking allegations were, however, kept secret for decades and a nascent inquiry into them was suppressed. While there appears to be no means of determining the precise number of civilian casualties incurred by US forces during Operation Speedy Express, it would appear that the extent of these casualties was in fact substantial and that a fairly solid case can be constructed to show that civilian casualties may have amounted to several thousand (between 5,000 and 7,000). Despite these findings, which have — in recent years — been aired in publications from the Nation to the Washington Post, the Vietnam War Commemoration ignores even the military’s own estimate that as many as 60% of those killed in the operation may have been innocents. Keep scrolling through the timeline and additional examples of dubious history regularly present themselves. Take March 15, 1969: “President Nixon ordered a B-52 strike on enemy bases in Cambodia. The first strike was made on 17 March and initiated a fourteen month bombing campaign labeled Operation Menu,” reads the entry. Next to it, there’s a picture of Nixon holding a press conference to announce the missions and point out the targets. Pretty cut and dried, right? Maybe not. Operation Menu was a coldly titled collection of B-52 bomber raids against suspected Vietnamese enemy “base areas” — given the codenames “Breakfast,” “Lunch,” “Snack,” “Dinner,” “Dessert,” and “Supper.” As William Shawcross demonstrated in Sideshow: Kissinger, Nixon and the Destruction of Cambodia, it was kept secret from the American people, Congress and even some top military brass via a conspiracy of silence, phony cover stories, the burning of documents, coded messages and a dual bookkeeping system that logged the strikes as occurring in South Vietnam, not Cambodia. Not exactly the kind of thing presidents tend to talk about on TV. (Even the Nixon Presidential Library and Museum’s timeline describes the attacks as “secret bombings.”) The image in the Commemoration timeline is actually from an April 30, 1970 press conference in which Nixon announced the “incursion” of US and South Vietnamese forces into Cambodia. It would take until August 1973, more than four years after it began, for the president to admit to the clandestine bombing campaign. It is difficult to imagine Presidential misconduct more dangerously in violation of our constitutional form of government than Mr. Nixon’s decision secretly and unilaterally to order the use of American military power against another nation, and to deceive and mislead the Congress about this action. Given all of this, it’s reasonable to ask whether the timeline entry didn’t warrant a few additional facts, slightly more context and, perhaps, a photo that doesn’t deceive the audience. Jadick answered none of my questions. “Our timeline is a work in progress and will continue to be reviewed accordingly,” she responded. “I have forwarded your concerns to our Branch Chief for History and Education for review.” When I checked back four months later on the results of that review, new procedures were indeed in place — for media queries! Now, all of them were being forwarded to Lieutenant Colonel Tom Crosson at the Office of the Secretary of Defense. Crosson? The name rang a bell. My follow-up request for answers to months-old questions was forwarded to Crosson in early December. A couple weeks later, I contacted him looking for a comment. More than a month has passed and I’m still waiting for an answer to any of the questions I first posed in August. A few days later, in a speech at the Vietnam War Memorial in Washington, DC, Obama continued praising Vietnam veterans, lauding their “sacrifices” and “courage,” their “valor,” “patriotism” and “honor.” He welcomed them home and commended them for helping “build the America that we love and that we cherish.” He told the veterans present, “You earned your place among the greatest generations.” Obama even gave a passing nod to the civilian toll “not just in Vietnam, but in all wars,” even if he then followed it up with some eyebrow-raising lines. “We hate war,” he intoned, though a history of almost constant warfare and overseas military interventions suggests otherwise. “When we fight,” he continued, “we do so to protect ourselves because it’s necessary.” The tacit suggestion being that, somehow, barefoot Vietnamese guerrillas seeking national reunification also had designs on the United States. Setting the record straight seems, however, to be the last intention of the United States of America Vietnam War Commemoration. When I called with my questions last August, the Commemoration’s M.J. Jadick said, “This is something you should be able to get an answer for.” Yet for six months, government officials have failed to provide me with any answers about the creation of their timeline, about its seeming lack of adequate context, about entries that are at best insufficient and, at worst, dishonest or just plain wrong. And in that same period, none of the obvious errors and obfuscations I pointed out has been changed in any way. The United States of America Vietnam War Commemoration website asserts that its “content will not contain misleading information or unsubstantiated claims,” but instead be “evaluated for fairness and acceptability as being in the best interest of the public.” The site goes on to claim that it will “provide the American public with historically accurate materials and interactive experiences,” but the timeline suggests other motives at play. You don’t need cybernetic eye implants and immersive propaganda portals to alter history. 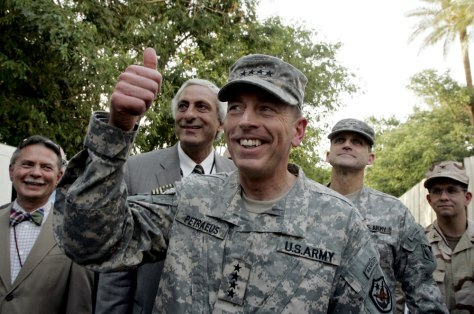 You don’t need a digital David Petraeus or a President Bush avatar to distract you from the truth. You don’t need to wait decades to have disinformation beamed into your head. You just need a constant stream of misleading information, half-truths and fictions to be promoted, pushed and peddled until they are accepted as fact. Welcome to 2053. Mission accomplished.